Ephesus sports light-emitting diode known as LED is illuminating the Men’s College Basketball Championship games March 31 – April 3, 2017 at Phoenix Stadium in Glendale, Arizona. Eaton power management company is also scheduled to provide LED lighting and controls system for the 2019 Final Four games at U.S. Bank Stadium in Minneapolis, Minnesota then again in 2020 right here in Atlanta, Georgia at the brand new Mercedes-Benz Stadium. The Sports Techie community blog covers Eaton’s sports technology stories because of our focus on sustainability such as the trend towards installing solutions or converting venues to more energy efficient LED light fixtures. These systems are more eco friendly while creating more illumination making the viewing better for fans in the facilities, on HD TV and digital devices, as well as enhancing player performances. Ephesus sports light-emitting diode known as LED is illuminating the Men’s College Basketball Championship games March 31 – April 3, 2017 at Phoenix Stadium in Glendale, Arizona. March Madness is an American sport tradition unlike any other sporting event on the planet. Much the same can be said for Eaton’s industry-leading control functions as the best world’s best option for experiencing an LED lighting system that provides facility operator’s sophisticated control to improve the viewing experience for spectators in-stadium or at home while assisting with the production of mind-blowing pre-game and halftime shows. The ability to control the patented color temperature tuning capabilities gives users the required lighting needs necessary to produce a wide range of events using only the push of a single button. LED is lighting the courts at the three stadiums hosting the semi-final and championship games making Eaton a clear lighting tradition today and in the near future. Perhaps the biggest feature college basketball programs and their buildings enjoy is the proprietary technology that fades light gradually from the ends of the court to the stands. This innovative tech helps create consistent depth perception for the players, coaches and officials regardless of the venue size, making installation perfect for a smaller sized college basketball arena or an enormous stadium. The Ephesus sports lighting solution is operational at three arenas hosting first and second round bracket games this season including KeyBank Center located in Buffalo, New York, Bridgestone Arena in Nashville, Tennessee and the BOK Center in Tulsa, Oklahoma. The new Little Caesars Arena in Detroit, Michigan and Bridgestone Arena will host next year’s men’s regional rounds played under Ephesus LED sports lighting, as will the famous Rupp Arena in Lexington, Kentucky and Webster Bank Arena in Bridgeport, Connecticut, two sites selected this year to host the women’s tournament first and second round games. Eaton’s Ephesus sports lighting helps provide optimal lighting that illuminates more uniformly on the playing surface and provides an improved stage for players and fans. The system is easy to install, requires little to no maintenance for years and offers lower total operating costs compared to other traditional sports lighting systems. These benefits have led to numerous college basketball arenas installing Eaton’s Ephesus sports lighting solution. 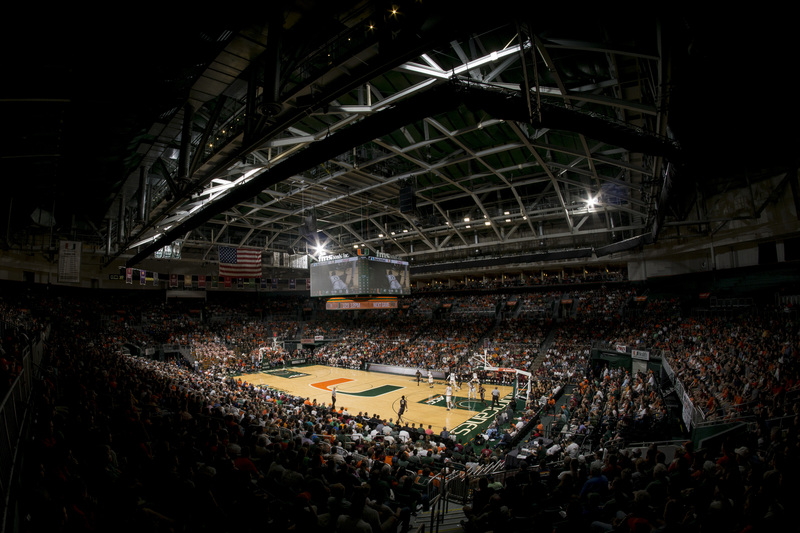 University of Miami – Watsco Center – Credit JC Ridley. Eaton’s Ephesus solutions continue to lead the rapid acceptance of LED lighting at sports and entertainment venues, especially for hoops. These include: Exatech Arena (University of Florida), Watsco Center (University of Miami), LJVM Memorial Coliseum (Wake Forest), Bartow Arena (University Alabama-Birmingham), Ryan Center (University of Rhode Island), Mackey Arena (Purdue University), Freedom Hall (East Tennessee State University) and more. Hundreds of facilities have made the switch to Ephesus LED sports lighting systems including more than 25 professional sports venues in all major sports, including: Hard Rock Stadium (Miami Dolphins); Globe Life Park in Arlington (Texas Rangers); and the first NASCAR track with LED lighting – the historic Martinsville Speedway in Virginia. 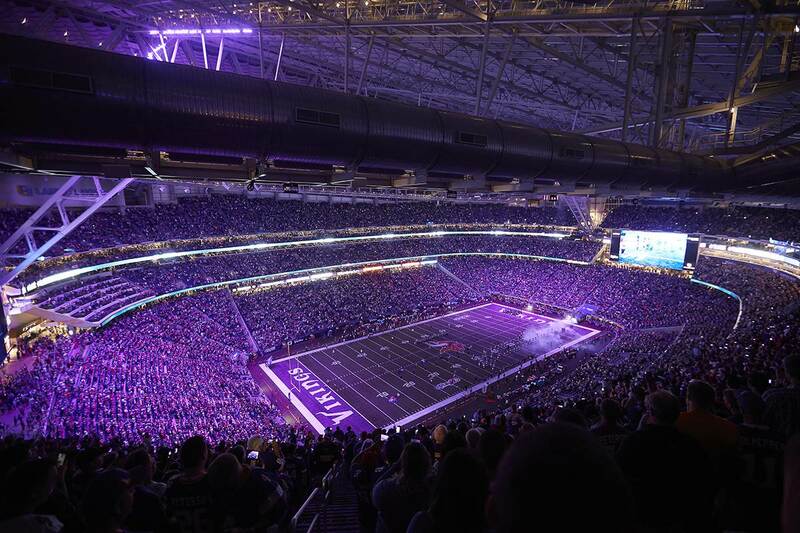 Eaton power management company is then scheduled to provide LED lighting and controls system for the 2019 Final Four games at U.S. Bank Stadium in Minneapolis, Minnesota then again in 2020 right here in Atlanta, Georgia at the brand new Mercedes-Benz Stadium. Sports Techie, the business of sports has a responsibility to the planet and consumers to shift towards more green solutions. It is good to report that 3 of the next 4 men’s college basketball championship games will be held under Eaton LED. 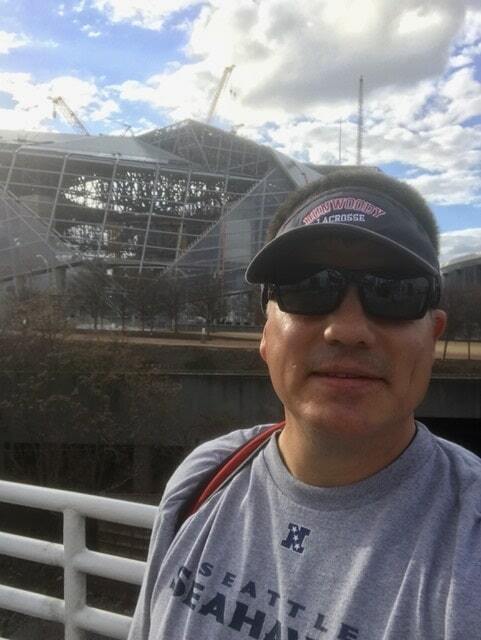 If you are attending this year’s Final Four at UOP Stadium be sure to take a moment to look up towards the light fixtures and know that Ephesus sports lighting is delivering the lights as will happen in 2019 at US Bank Stadium and 2020 inside MB Stadium in Atlanta. Ephesus sports lighting and LED have become a new basketball tradition. Eaton LED installs are cutting down on the use of power regardless of venue size. Their system also enables more features and technologies for operators to use enabling improved illumination resulting in happier fans, players and coaches, broadcasters and sponsors alike. I hope your march madness bracket is not a total bust yet. I picked UCLA to be the champions. Thank you to Eaton for sharing this story with our international community. 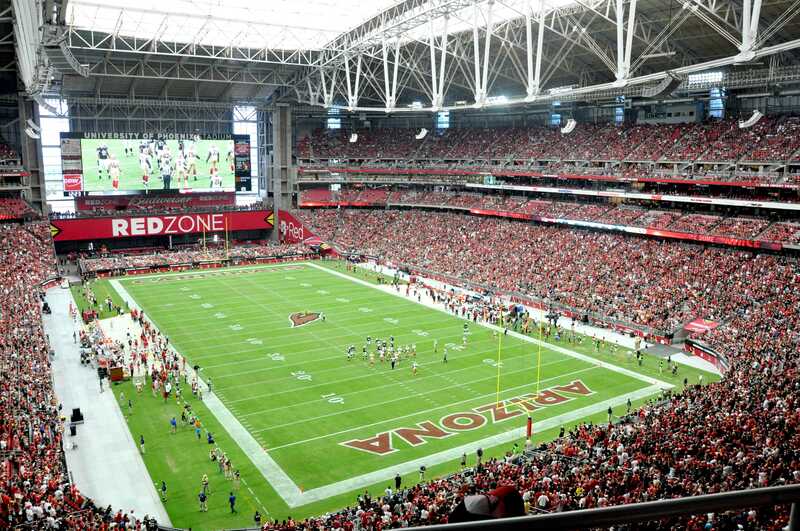 University of Phoenix stadium lighting for the NCAA Final 4 was augmented with 4-100K Softsuns.